Every once in a while, and album comes along that stands apart from all others, either in your personal collection or the musical listening library we all carry around in our heads. Humbly, I would submit that IF, the latest offering from Glass Hammer, is exactly that. But first, I must set the table before I present the banquet. I grew up in the 70's listening to Yes and Genesis, my two favorite Prog bands as I grew into loving music, more and more. Over the years since then, I've embraced and loved many, many other bands that surfaced after the revival of Prog in the 90's and since. Spock's Beard, Flower Kings, Kino, Frost, Transatlantic, Dream Theater, Marillion, Saga, Asia... the list goes on and on. Ah, but since then, it's been a match made in heaven. 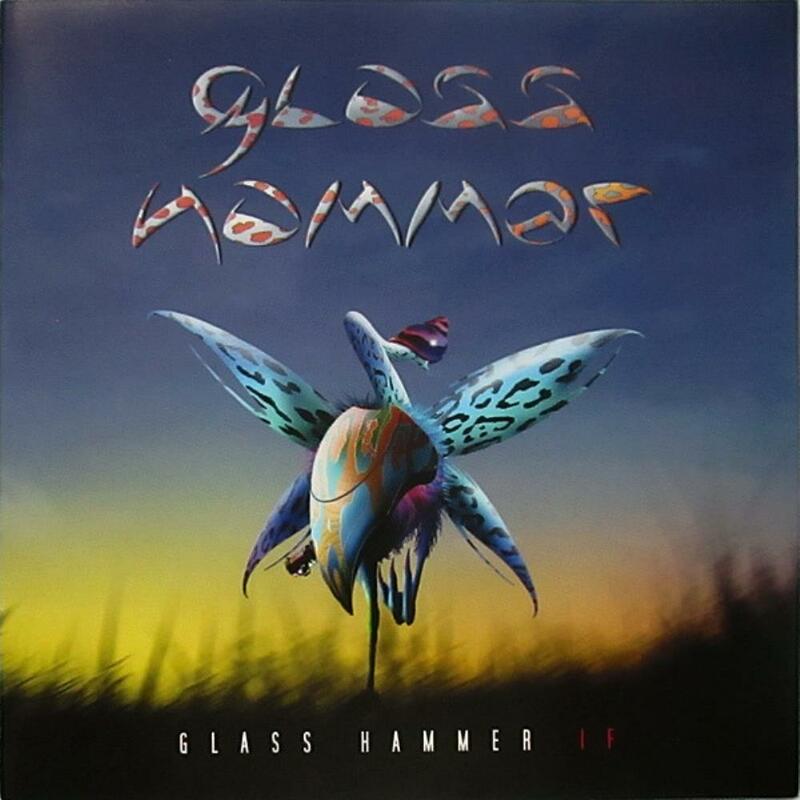 Glass Hammer makes new music, and I, I soar and fly, loosing myself in the magical weaving of musical textures and sounds, flying high and filled with joy, at such sound manifested. Which brings me to the latest offering by this amazing band, IF. Having seen some advanced sneak peeks of the album cover, I was instantly intrigued and excited. Wow, amazing art work and design, and yes, it definitely resembled many a Yes album cover by Roger Dean. To me that was an endearing omen of sorts. Sound. Such sound. Soaring synths, layers of organ and guitar, and that oh so immense growling bass sound that I love and adore. Then a voice. A new voice. Ahhhhh.... Yes, Jon Davidson sounds similar to Jon Anderson of Yes, and no, he is not the previous vocalist, Suzie. That was both confusing for me, and ultimately liberating. The music, the voice, this sound I was hearing was something new and old, both. It grabbed me from the very first bars to Beyond, Within, and never let me go. I've had the album almost a month now, and quite frankly, I'm not even close to be tired or content in my listening, for it still is in my truck's CD player, having been played over 40 plus times now, from start to finish. Not normal at all for me, but I truly can't conceive of listening to any part of it without the rest. The music is seamless, moving from one song to the next, but the underlying theme is constant, making the entire album a spell binding listening experience. Yes, each song can stand on it's own, but why, oh why would I bother to listen to one piece, when the whole still grabs my soul and cuddles it in Prog Heaven with each listening? I'll be investing in some repair materials for the dash in my aforementioned truck, those growling bass lines have resulted in a pure pummeling of my dash, I can't help it, I must beat my fists to that awesome bass sound. As a prog fan that truly loves progressive rock like no other genre, I am proud to share my humble thoughts, and say this is my Album of the Year. I've loved and adored many other offerings by some very fine bands and musicians, but once in a while, maybe once in a lifetime, something comes along that shakes the very roots of your beliefs or accustomed preferences, and for me, this album IF is exactly that... An amazing, unparalleled GIFT. I can't stop listening to it. And I'm OK with that. I don't sing quite as well as Jon Davidson, but I don't let the stop me from accompanying him on every note. I don't play bass anywhere near as good as Steve, but I haven't let that stop me from memorizing every single lick or growl he emotes from his bass guitar. And I will never be the keyboard player that Fred is either, but my fingers continue to play phantom duets with him, with each listen of the CD. IF you have an open mind and Prog heart, this is the album for you. IF you have wondered where the magic in music disappeared to, my GIFT to you is IF. IF you listen to no other CD this year, listen to this one. I promise you will discover something beyond anything else offered by any other band, recent or in the past. IF you love hearing the best Prog band on this planet, then you must buy this CD! I may eventually remove it from my truck's CD player, but I imagine by then, a year will have passed, and Steve and Fred will have something newer for me to replace it with.